The book published in 2010 by Alexander Osterwalder entitled “Business Model Generation” caused quite an uproar in the world of consulting. The book is practical, very nicely done and above all completely different from anything else previously published in the sector. And its success proves the author right. 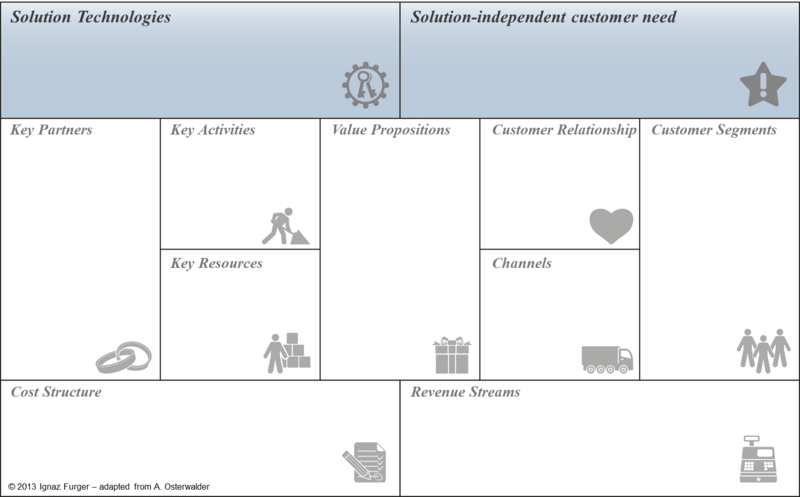 The volume was the subject of intense discussions with A. Wettstein, who has worked with the Business Model Canvas from the beginning. These talks revolved mostly around the question of how the Business Model Canvas and other methods described in the book can be used in consulting businesses searching for new areas of growth. We are both strongly convinced by the model and see that it has enormous potential, not only for start-ups, by also for established companies. And yet, something was always irritating me. As practical as the model canvas is, I noticed that something was missing. It is not as though Alexander Osterwalder has re-invented the world. Even if he has presented a very practical and pragmatic approach, much can be found in it from other known approaches and models – or maybe not. What I have been missing from the beginning, as what our discussions confirmed, is the element that is being called the “solution-independent customer problem”. I have always separated this element from the product or service offered. A watch is a product with a value proposition, namely to measure time. But the customer problem exists independently of the watch and can even be solved in a completely different way. This is even more applicable when we sell the watch as a luxury item or status object. It is what Clayton Christensen in his books calls “The job to be done”. With Osterwalder, “The job to be done” finds its place in a separate canvas. Which is a shame, actually. So I then busied myselve intensively with figuring out how this element could be added to the model canvas without destroying or damaging it. And as it happens often the best ideas come while being on his own. So I had a flash of insight during an extensive jog through the woods Zurich: If one compares the model with Aloys Gälweiler’s well-known navigation system, in the highest level, the innovation level, he describes two elements that are completely lacking in Osterwalder’s model: One is the already mentioned “solution-independent customer problem”; the other one is what Gälweiler calls “the technological solution” precisely for this problem. With these two elements, the model canvas can then be completed. A chain then arises: customer – customer problem – technology – product, or if you prefer: product – technology – customer problem – customer. Innovation is known to come from two sides: from the market and from technology. The best representation of this is the model by Prof. Hugo Tschirky, who teaches at the ETH Zurich and who has developed a comprehensive approach to innovation management. On the basis of our in-depth preoccupation with Osterwalder’s approach, we have worked out a practical method for this concept, adding the two new elements to the model. 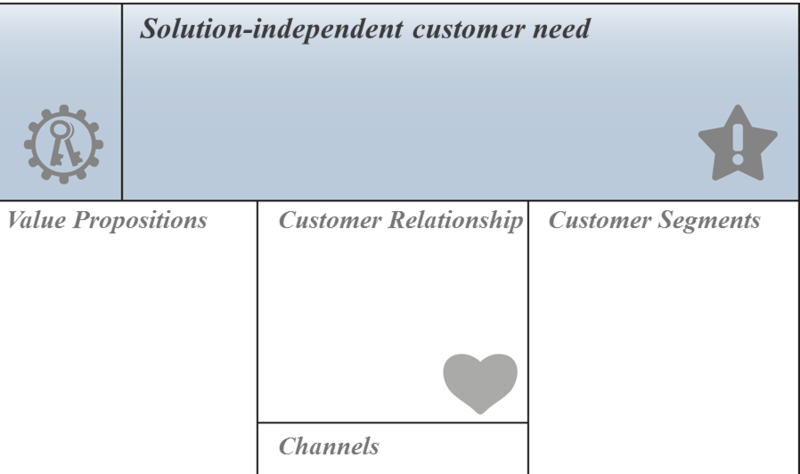 Allow me to introduce to you here the “extended or dynamic model canvas”. In addition to the description of each of the elements let me show here a proposal for the description of the two additional elements „Customer Problem“ and „Technological Solution“. This module represents the problem a customer has which a company wishes to resolve – namely, the ‘solution-independent customer problem’. Here we use the terms ‘customer problem’, ‘customer need’ and ‘customer wish’ interchangeably. The solution-independent customer problem is in most cases latent and is often better resolved in a different way through new projects or services. This customer problem can be solved by something providing a benefit, and it is for this benefit that the customer is prepared to pay. For example, a customer ideally does not pay for a watch, but for the ‘solution to the problem’ of being able to know the exact time at any moment – unless the watch is a status symbol. Or the product “car” is not primarily a sophisticated machine on four wheels even though beautifully designed, but it is the possibility of getting from A to B at any time. It is often beneficial to abstract a business idea from this ‘problem’ in order to come to new technological solutions. From a market perspective, innovation is mainly concerned with, and can only function when, knowing the problem exactly. This problem can be originary, such as eating and drinking, or a secondary or derived problem, such as luxury items, vacation or other goodies which satisfy more than elementary needs for the day to day life. Which customer benefits do we wish to satisfy? What does the customer actually pay for? What is the background of the solution to the problem? What are the true purchasing criteria? Which purchasing criteria are better solved by our products? This module represents the technological solutions behind a product or service. These technologies generally have a certain life cycle and after a certain time are replaced by new technologies that can solve a customer problem better and more cheaply. A substitution process then sets in that replaces the existing products on the market. The pattern normally follows an S-curve. An example here is the substitution of the automobile for the horse-drawn carriage. Innovation is found in the interplay of knowledge of the originary customer problem and new technological solutions. The timeframe of the substitution differs; it can take years or even decades. The first embodiment of a new solution concept is called invention; true innovation is only then when the product is on the market. Technological solutions can be incremental improvements or completely new concepts, such as the laser printer or fax technologies which provided a substitute for the telex (whose invention, by the way, dates back to 1931). What are the existing technological solutions behind the products? Where does our company have competencies – core competencies? In which stage of life are these technologies? What new inventions are pending and which customer problems could be (much) better solved with them? Which purchasing criterion could we significantly improve? Dieser Eintrag wurde veröffentlicht in Aktuelle Themen, Innovation, Konzepte, Strategie heute, Strategieansätze von Ignaz Furger. Permanentlink.